Identification: This is a tiny, elongate species with a reduced shell. There are low ridges on the sides of the head giving it shovel-like appearance. 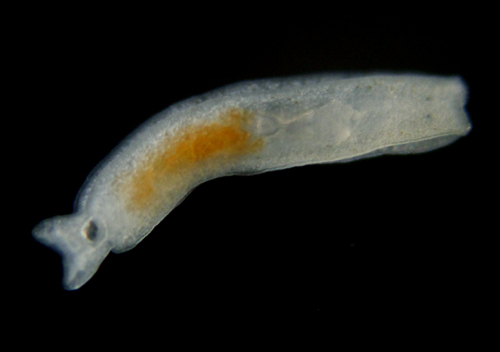 Its body is largely opaque with a more constricted posterior than Philine sp. #4. It's distinguished from the similar-appearing Philinoglossa by the presence of a gizzard. Natural history: Philine sp. #5 is a rarely seen species found living interstitially in sand. Taxonomic notes: It was first recorded in Hawaii at Kaneohe Bay, Oahu by the 2017 MarineGeo meiofauna team in May, 2017. Photo: Katharina Jörger: 1 mm: 2017 MarineGeo; found by meiofauna team; Kaneohe Bay, Oahu; May, 2017.